Germany was set to honor the Italian police officer who shot dead the Berlin Christmas market Muslim mass murderer who had escaped to Milan, Italy. He went from hero to zero. The Italian cop who fatally shot the ISIS terrorist responsible for the Berlin Christmas massacre has been exposed as a Nazi sympathizer – and Germany has now called off plans to hail him for his role in taking out the killer, Bild newspaper reported. 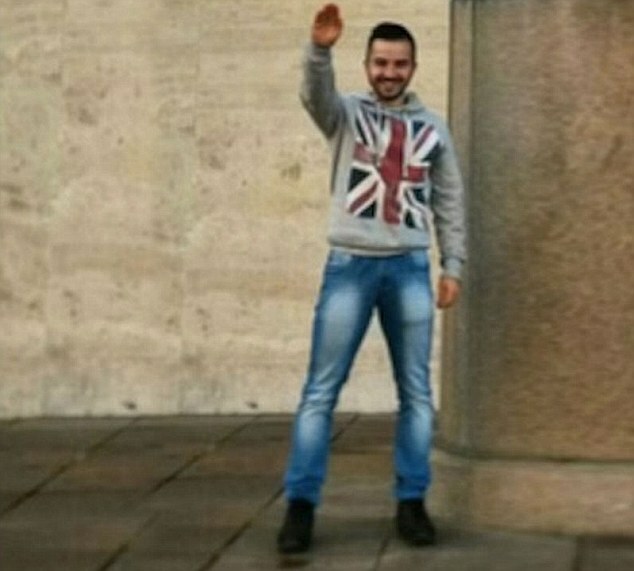 A shocking image has surfaced showing Officer Luca Scatà extending his arm in a Nazi salute with a big grin on his face, according to the German paper. His police partner, Christian Movio, 36, who was also was involved in the ISIS takedown, is believed to have totalitarian views, too. LUCA SCATA DOING THE ROMAN SALUTE. German officials have now nixed the idea of recognizing the two officers for their heroism in tracking down and killing Islamic State extremist Anis Amri in Milan, Italy, on Dec. 23. Five days earlier, Amri had hijacked a truck and plowed through a crowded Christmas market in Berlin, killing 12 people and injuring scores more. The Tunisian-born terrorist traveled to the Netherlands, Belgium, France and then Italy, where the two cops caught up with him. During an ensuing gun battle, the extremist wounded Movio before Scata shot Amri dead. Luca Scota, you will always be a hero to decent people everywhere. Screw Germany’s Angela Merkel and her political correctness. Thanks to you, good sir, there is one less person terrorizing innocent men, women, and children.